Products - Olive Oil - Frantoio Olivestri - Umbria - Casa de Case, Inc.
Frantoio Olivestri holds a very special place in our hearts. It is where Casa de Case started. We discovered this beautiful olive oil on a trip to Italy many years ago and started importing it for our personal use. We took it to several restaurants who attested to its extra fine quality. We decided to make a business of importing this oil, and now it still holds a pinnacle position among the more than dozen oils we offer. an important moniker of quality. If you are not familiar with it, read about it here. This oil is made by Guido Vestri ("oli~vestri") in his artisanal mill in the tiny town of Petrignano Del Lago in the rolling hills west of Lake Trasimeno. It is within the D.O.P. zone Colli del Trasimeno - the hills of Trasimeno. The town in virtually on the Tuscan border, not far from the famous hill towns of Cortona and Montepulciano. You can see the map below. Guido Vestri doing what he does best! The Olivestri frantoio, where the oil is lovingly handcrafted, is amongst the tiniest in Italy, and it is one of the few frantoii in this part or Italy to offer vendita diretta - direct sale. Almost all of the olive production in this region is taken-up by cooperativi - a cooperative that crushes the owner's olives for their own consumption. Very little of this region's superb production makes it to the market. Guido is ferociously dedicated to quality. He uses only hand picked olives to guard against bruising which can introduce decay to the fruit. He carefully mixes his own formula of varietal olives which are typical of the region, mixing Leccino, Frantoio, Moraiolo, & Dolce Agogia. He insists that the olives be crushed within 24 hours of being picked. This is what insures that there is no oxidation of the olives, and it is what produces the freshest oil with the highest possible level of polyphenols, the good-health promoting anti-oxidants that reduce LDL (bad) cholesterol. This also delivers an oil high in vitamin E, and give the oil longevity, still tasting fresh for up to two years. The olives are picked starting in late October to insure a percentage of under-ripe fruit, producing the golden-green color and extraordinarily low .2 degree of acidity with a perfect balance between fruit and acidity. 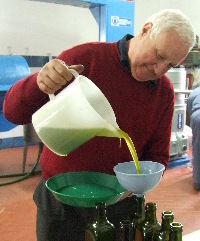 The oil made by Guido and his family is among the finest olive oil produced in the world. It has justifiably earned a gold medal and reflects their Umbrian/Tuscan border location, deriving its perfect balance from Tuscany's big, strong tradition and Umbria’s more mellow background. Frantoio Olivestri produces only a single extra virgin olive oil. We import it both in bottles and in five liter tins. It is, in fact, the only finish oil we carry in five liter tins, a testimony to the popularity of this oil as an elegant finishing oil. In bottles it carries the label Siloro (named after Silvia, Guido's daughter) and in tins it is labeled Fiordolio (named after Fiorella, Guido's wife). Siloro is a golden oil with deep green overtones and a classic Tuscan/Umbrian nose of freshly cut grass and the intoxicating aroma of freshly pressed olives in the frantoio. The tastes are very complex and intense with many overtones. The finish is mildly peppery. This oil has a perfect structure that, once tasted, will entice you back for more. The feel of the oil is morbido - soft and creamy. It is not at all bitter and it is not astringent. This oil is for discriminating palates that prefer their olive oils to add character and nuance to their dishes. These characters give this oil great breadth in application as a finishing oil. It is equally at home on meats, vegetables and fish. This oil is perfect for finishing all roasted meats, it is spectacular used raw over cooked vegetables like asparagus or tomatoes. Many of our restaurants that want to select a single finishing oil that has very wide application select Frantoio Olivestri. Once a year with the new harvest we fly in the new pressed olive oil - the olio nuovo, and it is Frantoio Olivestri that is our choice, because there is no better.